St. Nick is often used as another name for Santa Claus but in truth Nicholas is the original. Born in the third century a.d., Nicholas became well known for his charity to children and others. He was imprisoned by the Romans and beaten. He never renounced his faith. Later when released when Constantine became emperor, he continued his life serving God and his faith. He lived to be a very old man dying on 6 December 343. Stories of his charity to children and others spread and long after his death people still revered him with churches built in his name. Stories of miracles attributed to him emerged as well. The Roman Catholic Church, Eastern Orthodox, Greek Orthodox, Anglican and Lutheran churches all have his feast day on their calendars (those using the Julian calendar celebrate it on 19 December). The Roman Catholic Church did not strip him of being a saint. Until 1968, every saint had a feast day that had to be celebrated in every diocese. What they did was make certain feast days optional and allow each diocese to decide whether to celebrate it or not. St. Nicholas is an optional feast day so it is up to the diocese to decide. Stories of a mythical gift giver (often from pagan beliefs like forest elves that leave presents for nice kids) became popular in many European countries and were imported to the U.S. Various aspects from German, Dutch, and English were blended to create the character–the commercial character–of Santa Claus. There is no connection between St. Nicholas and the modern day character that lives in the North Pole, has flying reindeer, and elves to make toys. Santa Claus is a purely secular and even by some standards a pagan creation with no connection to St.Nicholas or Christianity. Remember that when someone says Santa Claus ought to be banned because is based on a religious figure. For further information about St.Nicholas, go to Saint Nicholas Center. By the way, there is a resurgence in celebrating the feast day. Usually children get treats (in stockings or boots) and often kicks off the Christmas season. So what do you think– Santa Claus or St. Nicholas? So what do you think? Santa Claus or Saint Nicholas? Instead of musing about Titanic I decided to offer some thoughts and more about the Christmas season. Martin Luther, when he rebelled against the Catholic Church, desired to reform Christmas to reflect its true meaning. So he decided that gifts ought to be coming from the Christ child (Christkind in German). The problem was convincing kids and everyone else to accept gifts coming from a baby. So they eventually developed a convenient stand-in, an angel who serves as a gift-giving Christ child that flies around on Christmas Eve leaving presents. The name Christkind stuck and today young female girls are selected to be Christkind in German cities and towns. Dressed in white with glittering gold wings and crown, she makes many public appearances to spread the joy of the season. In Nuremberg the Christkind is usually a 17 year old girl chosen in a city-wide contest serving for two years. The post comes with chauffeur to drive her to the many appearances required in December and afterwords. Yet Luther was unable to dislodge St. Nicholas, whose feast comes on 6 December, as he was too beloved a figure for many. 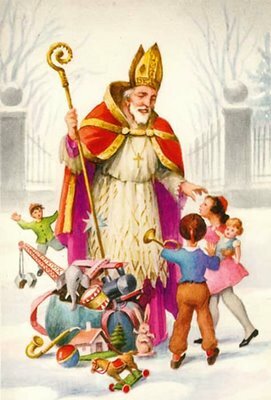 So German children got the best of both worlds with both St. Nicholas and Christkind. And today St. Nicholas is more popular than ever and not just in Germany. His feast day is celebrated in many countries and usually the beginning of the Christmas season. Some of the renewed popularity comes from the import of another gift-giver: Santa Claus. Santa Claus is a composite figure drawn from several sources. It begins with the real Saint Nicholas but draws upon the British Father Christmas (a figure that went through several changes from pagan, to saintly, then a merry party giver and finally a gift-giver), the Dutch Sinterklaus, the French Pere Noel, and even the Christkind. Some versions, like the French, Dutch, and Swiss, have him accompanied by someone to remind children to be good (or he might take you away in a sack!). With early settlers being English and Dutch, Saint Nicholas was very popular but Sinterklaus was too hard to say and became Santa Claus. Santa Claus then took on attributes of the Christkind in being able to fly around and hand out toys. Clement Clarke Moore’s A Visit from Saint Nicholas (1822) added that he had a sleigh pulled by magical reindeer. He could go up and down chimney by touching his nose. These fairy-tale attributes had add-ons later with him residing at the North Pole and elves making toys. The image of Santa Claus as a jolly fellow with apple cheeks and twinkling eyes came from illustrations in Harper’s Weekly in the late 1800’s. His commercial appeal became apparent to shopkeepers and department stores. And Coca-Cola used him in the 1930’s to advertise during the Christmas season. Santa was completely secularized and turned into a fairy-tale figure. Nothing of his connection to Saint Nicholas remains (except the use of the name St. Nick). Today when I read that Santa Claus has been removed (because he might offend someone or is considered religious) I laugh. There is nothing religious about Santa Claus. Replacing him with Frosty the Snowman (a character created for an animation) does nothing but shift images with no connection to the importance of the holiday. Which is also why you rarely see images of Santa Claus inside Christian churches. You are more likely to see a rendition of Saint Nicholas as a bishop or illustrations of him handing out gifts to children while wearing his holy office. If there is one good thing to Santa Claus is that we can have Saint Nicholas stand apart. He was a genuinely good man who cared about children and those being harshly treated (he suffered for his faith by being imprisoned). He reflected his faith in Jesus in how he lived. Remembering and honoring the real Saint Nicholas means looking towards the real meaning of Christmas rather than a fairy-tale creation called Santa Claus. -The Hallmark Channel’s The Christmas Card is destined to become a Christmas classic. A soldier in Afghanistan gets a Christmas card from young woman in a small mountain town in Northern California. While on leave he visits the town and meets the woman and family. In short he falls in love with her but there is a complication: she is engaged. Ed Asner plays the father and one of his best roles in recent years. Rent or buy it: you will like it! -Dogs with antlers: bad idea! -I like “Grandma Got Run Over By A Reindeer.” How many Christmas themed songs have a verse like this: “They should never give a license to a man who drives a sleigh and plays with elves.” On the other hand I can do without the Chipmunk Song. Always gets on my nerves. -Fruitcakes are disliked in this country because the mass produced varieties are terrible. Alton Brown demonstrated on his show Good Eats how to make one yourself and the key is good ingredients. Bad ingredients=bad fruitcake no matter how much booze you add to it. But you can buy good fruitcakes by seeking out good bakers. Some of the best fruitcakes are made by religious orders. The Mondo Fruitcake blog rates many of them. I get a fruitcake every year from the Assumption Abbey in Missouri and never disappointed. Give real fruitcake a chance and taste one of the recommended ones at the blog. But avoid the mass produced ones at all costs. They are almost always overly sweet, rely on cheap ingredients, and truly are doorstops. Well that wraps it up for this Christmas. 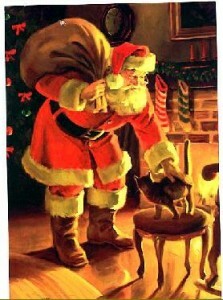 I wish everyone here a very Merry Christmas and all the best for 2011.